Color grading is an extremely important part of filmmaking and photography process. Smart color grade can make the difference between visually interesting shot and a dull one. It can help convey the story and set the atmosphere for the whole film. When properly done, color grade can take average footage or image and transform it into visually interesting one. It can really enhance the viewing experience. However, color grading can also ruin a beautiful footage if done improperly and destroy all the hard work put into filming it. It is extremely important to follow a few simple rules when it comes to color grading in order to make sure it enhances your footage. When you’re using 3D LUTs as a part of your color grading process, it is even of higher importance to follow these simple rules. Color grading can be all the difference between a dull and visually interesting shot. 3D LUTs are nothing new. They’ve been part of the filming industry for years and colorists and DITs have been using them successfully in their workflows for ages. Recently though they’re starting to be embraced by individual filmmakers and photographers. LUT stands for Look Up Table. In short, LUT is a table used to map one color space to another. For example, a LUT can remap a log image into Rec.709 space or it can be used to apply a preset look for any given image or footage. LUTs are commonly used to calculate preview colors for a monitor or digital projector of how an image will be reproduced on another display device. However, LUTs may be used as a starting point for color grading. LUT in this case represents the difference needed to make up between the result and the source material. In practical and simplified terms, a LUT is a look which you can apply to your image or footage in order to correct it or give it a distinctive, creative, starting point for your final color grade. There are two types of LUTs we can use in the color grading process. 1D LUTs – These LUTs may be useful for setting contrast, the white point of a display, or overall color balance adjustments but they do little to convey the complexities needed for creating a good looking image when grading. 3D LUTs – These LUTs overcome the limitations of 1D LUTs by placing color and luma in a 3D space, a much more representative way of how color works in real world. 3D LUTs are much more useful for capturing and relaying complex color grades than a 1D LUTs. What types of LUTs are there? These LUTs are used to normalise or tone map log images or footage into a standard color space such as Rec.709. Log encoding is a logarithmic encoding of the scene, meaning that the relation between exposure measured in stops and the signal is constant over a wide range. Each stop of exposure increases the signal by the same amount. This is done in order preserve as wide dynamic range as possible in the recorded image. The overall shape of the log curve is similar to the exposure curves of film negatives. Because of fundamental differences between a sensor and negative film, however, the color characteristics remain different. When viewed on an HDTV or computer screen for example, log images tend to look washed out. This is because a) the logarithmic scene encoding is different from the display specific image encoding and b) the colors cannot be reproduced by the gamut of the display. Enter log normalisation LUTs. These LUTs simply tone map log images into a viewable color space such as Rec.709. In order to show a grayscale characteristic and color reproduction that is visually correct, the log material needs to be tone-mapped for the right encoding and transformed into the target color space. 1D LUT can perform the tone-mapping so the resulting image will at least have a grayscale characteristic suitable for display. The transform into the target color space, however, needs to be done with a 3D LUT. This type of LUT contains both, the grayscale and the color transformation. Film emulation 3D LUTs are a result of meticulous matching between high-end scans of film stock and digital material. By matching hundreds or even thousands of individual hues of color, the film emulation LUTs are the closest thing to representing the characteristics of a real film stock. 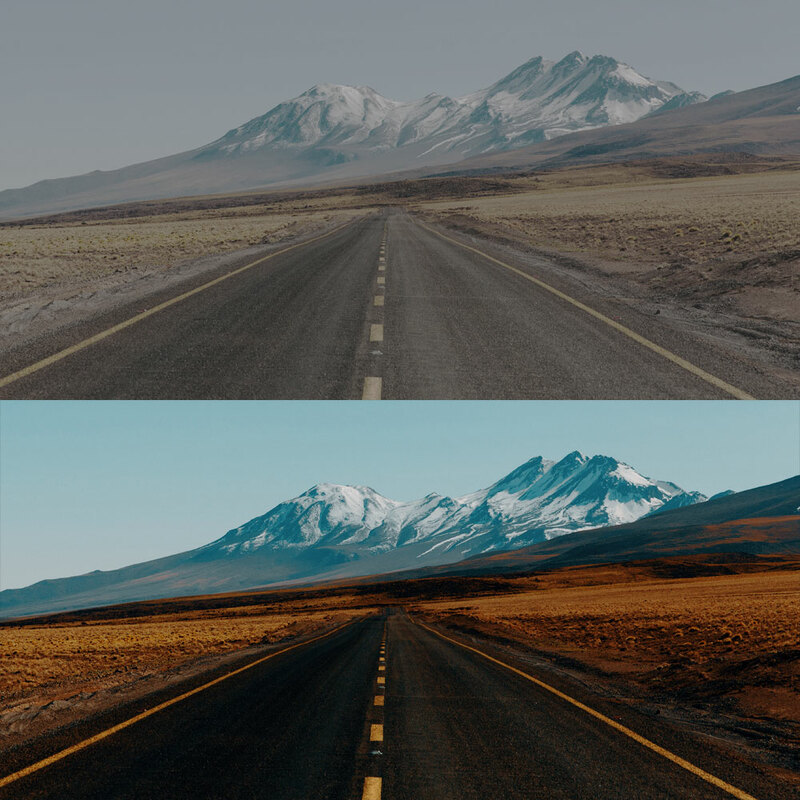 While it’s practically impossible to create a true film emulation LUT, meaning the characteristics of the material with the film emulation LUT that are identical to film stock, it’s possible to get accurate results simulating the characteristics of the film stock. The idea behind these 3D LUTs is that they’re not to be used as a starting point for the color “look” but rather as an emulation of a specific film stock. Therefore, film emulation 3D LUTs are usually more subtle in their characteristics. Creative LUTs are, as their name implies, to be used for creating different creative looks or rather as a starting point for creating a creative look for your footage or images. These LUTs usually offer bolder looks with distinctive color characteristics. Creative LUTs allow you to achieve a highly sophisticated creative look with a single click and this is their true power. Creative LUTs can save you hundreds of hours of guesswork. Getting the ‘pro’ look can be tough. By using high quality creative LUTs you can save hundreds of hours of guesswork trying to achieve the perfect color grade. When using 3D LUTs as a part of your color grading process it is extremely important to understand what LUTs can and cannot do for you and what are their limitations. First, it is important to understand that all LUTs are calibrated for properly exposed images and will yield predictable results only if used on such images. Over exposed, or underexposed images, images with blown out highlights and completely black shadows will result in less than optimal color grades. LUTs are calibrated for properly exposed images. In some cases, there may be a few LUTs calibrated to work properly on under or over exposed images but it will always be either of the two. A LUT cannot produce a satisfactory result for both under and over exposed images. 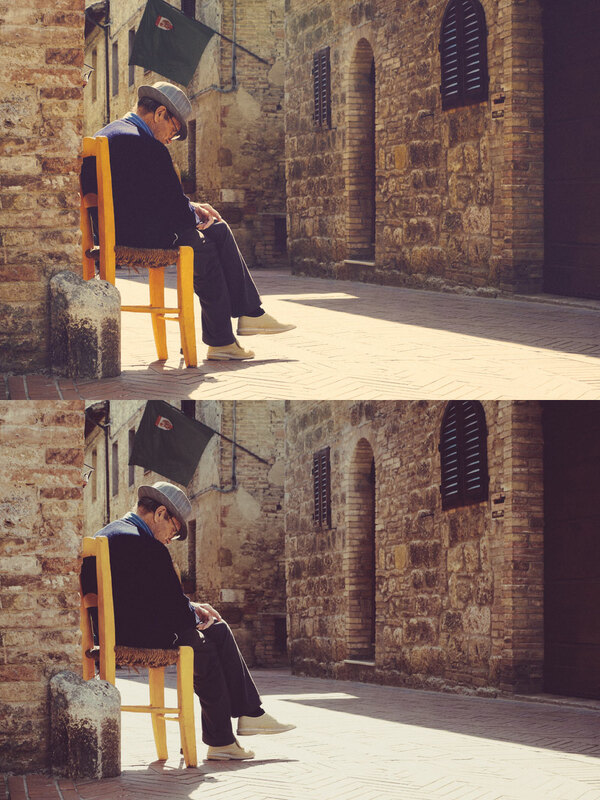 In this example we can see the same LUT applied to a properly exposed image (bottom) and over exposed image (top). As we can clearly see, over exposed image does not yield expected result. Second, LUTs are calibrated to produce satisfactory results for properly white balanced images. When you plan on using LUTs in color grading process, you should always match the white balance settings in your camera to the white point of you lighting sources. Only if you nail the white balance correctly will the LUTs produce predictable results. LUTs are calibrated for correctly white balanced images. You might get lucky and some LUTs may yield satisfactory results even if your white balance is incorrect but that’s not color grading. That’s guessing and being lucky. You don’t want to rely on luck in your workflow. Here we have the same LUT applied to correctly white balanced image (bottom) and to an image shot with cooler white balance (top). As we can see, the results are very different. Third, think of the LUTs characteristics before applying it to your footage and make sure there’s logical connection between the two. It is important to remember that a creative LUT is not going to appear correctly in every possible situation. Always exercise a good judgment before applying a LUT. For example cold, blue-ish tinted LUTs will not look as good on sunny images as they will on images shot under overcast lighting conditions. Always exercise a good judgment before applying a LUT. As a thumb rule, if the LUT defies the laws of nature, it’s probably better using a different LUT. Applying a cold blue-ish LUT on a sunny image, defies the laws of nature and will usually lead to less than satisfactory results. There is one last thing to remember. LUTs will not do your color grading for you! Say what? Isn’t that the purpose of LUTs? When we refer to a process called color grading we’re actually referring to a two step process. Color correction is the process of manually tweaking your image or footage in order to find a correct balance between exposure, color temperature, contrast and light. Typically, color correction would require you to correct the white balance, adjust the shadows, midtones and highlights, contrast and set the overall balance for your image and footage. This is something LUTs cannot do for you. LUT cannot “know” if you properly exposed your image, if you used enough fill light and if you used a correct white balance for your type of lighting. Moreover, LUT cannot match your exposure and contrast shot to shot, especially if they differ in exposure, contrast and type of lighting used. This is something you’ll have to do manually. Color transitions contained within a specific LUT are always applied in the same manner and amount no matter the material. There are no shortcuts you can take here. Top image, while very nice, would benefit from some small color correction before grading. White balance is a little bit too cold, the shadows are a bit too dark and the highlights could benefit from darkening them a little bit. 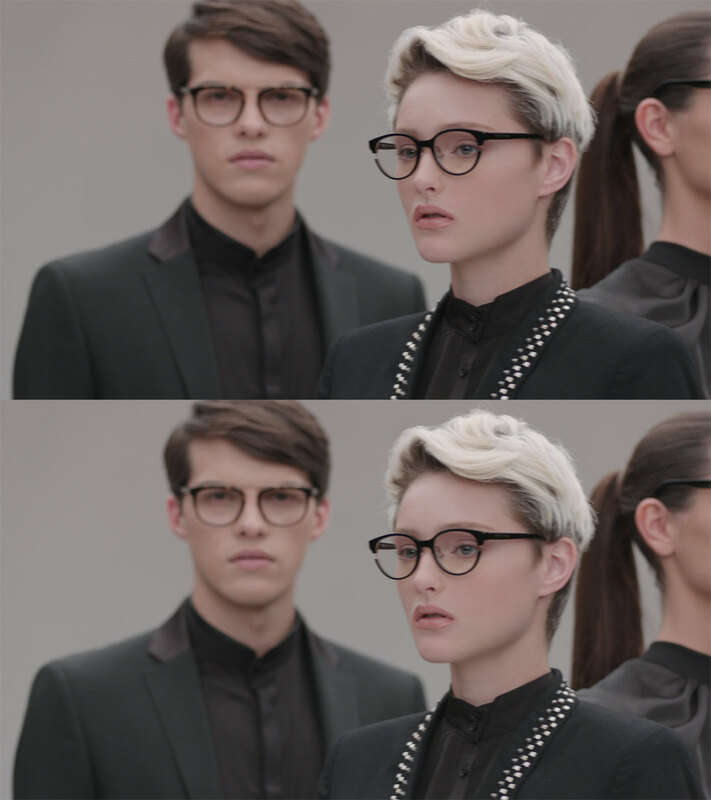 Bottom image, is much more balanced and a better starting point for a color grade. 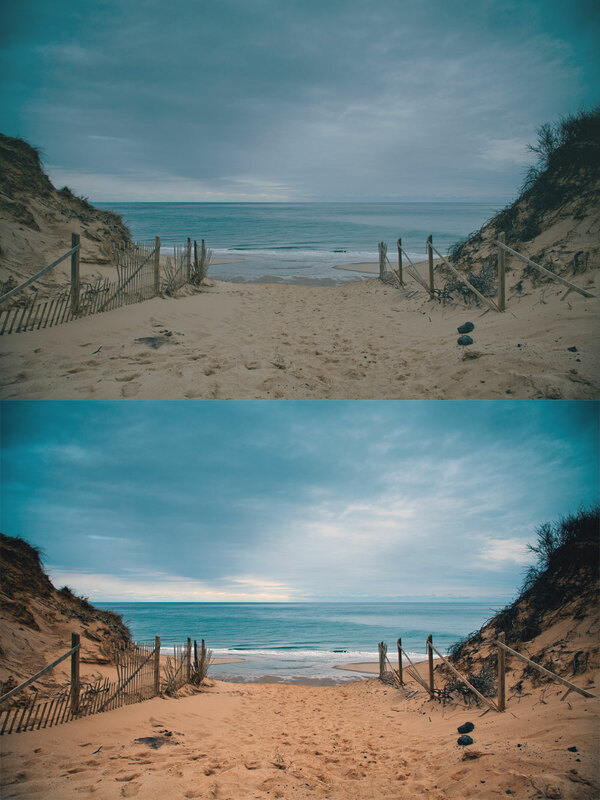 Indeed we can see that the bottom image responds much better to the same LUT being applied to both images. 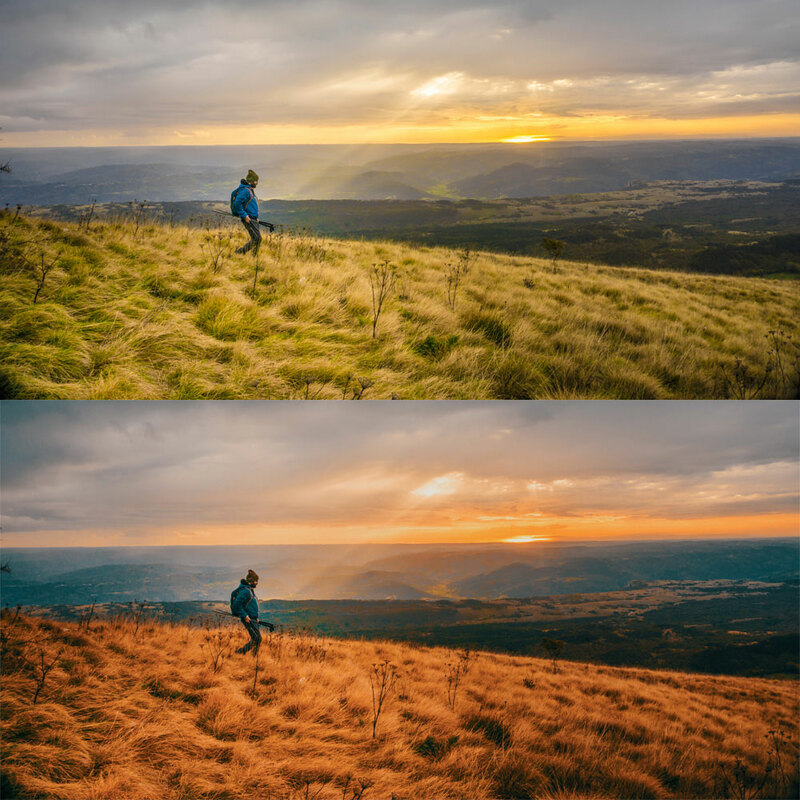 The difference in this case comes from the color correction being applied to the image before applying a LUT and that’s something you’ll have to do manually according to your image needs. Color grading is the creative process or manipulating your images or footage so that further enhancements are made to image’s color, contrast, lighting within the image, color gradients and more. Simply put, while color correction’s purpose is to normalize the image or the footage, color grading purpose it to creatively change it. Color grading relies heavily on proper color correction beforehand. LUTs can greatly enhance your color grading process. They can save you time trying to achieve the perfect look, they can get you very close to your final result and they can help you achieve a look you otherwise may have a hard time achieving. Achieving the following look manually can be a time consuming task. LUTs get you 80% of the way in one click. 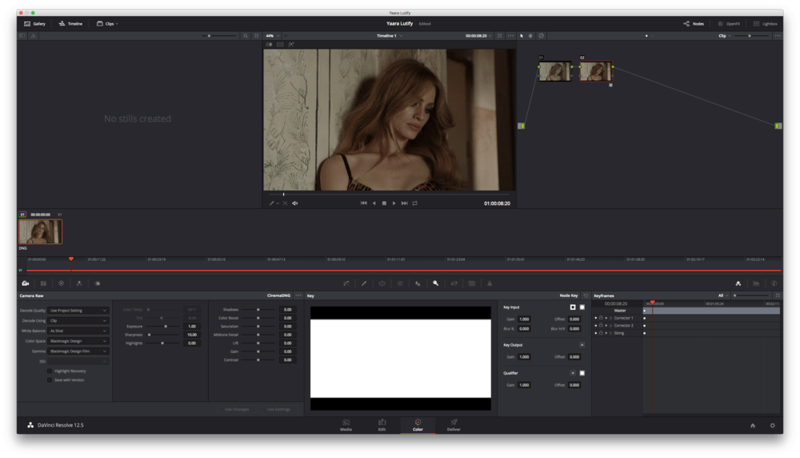 While technical aspects of color grading may be familiar to many aspiring filmmakers, editors, photographers and DPs, some may lack the creative vision necessary to achieve a certain look. After all, no matter how technically profound you are with your software of choice it won’t help you much, if you don’t know what you’re trying to achieve. In my opinion, this is the biggest strength of creative LUTs. They can bring you very close to your final color grade with utmost simplicity. LUTs not only save you time but they can greatly enhance your creativity. However, remember no two images are created equal so you’ll always have to exercise a good judgment when applying a LUT in the color grading stage and moreover you’ll always have to be prepared to make some manual tweaking to your image. Now that we have better understanding of what LUTs are and what they can and cannot do to your image, let’s see how we can make the most out of them. 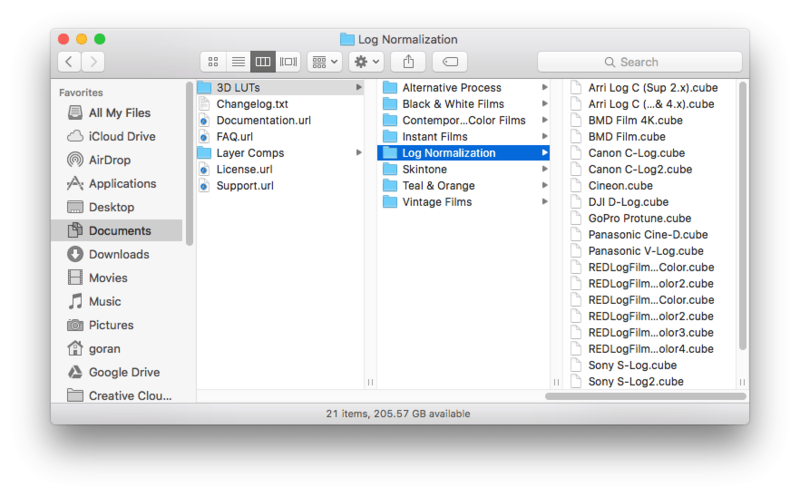 The very first step we should perform when working with log footage or images is to normalize them. It’s extremely hard to impossible to judge exposure from log images let alone color. Therefore, before doing any basic corrections, we should apply a log normalisation LUT to our image or footage in order to re-map it into a workable looking image. It is possible to manually normalise footage or images however it is very time consuming task and can require a lot of trial and error before nailing the correct image. Very first step is normalising your image from log to a viewable color space. We at Lutify.me provide you with 16 different log normalisation LUTs that cover every possible log (or semi log) format out there. In order to normalize your image, open the Log Conversions folder within your 3D LUTs folder and apply the appropriate log LUT to your image. For example, if you’re working with Sony S-Log2 footage it makes sense to use the Sony S-Log2 log normalisation LUT. You should apply this LUT before any other corrections. If we’re applying the LUT inside Photoshop, we should apply it as the very first adjustment layer, as the first node in Davinci Resolve, as a Basic Correction LUT in Premiere Pro or as the first layer in Color Finale if we’re applying the LUTs in Final Cut Pro X with the help of Color finale plugin. Log normalization should be performed as the very first step. It’s hard to judge log images before they’re normalized so doing any corrections on log materials apart from normalization would be a waste of time. Log images are hard to judge and therefore they need to be normalized. In this case, the BMD log is relatively easy to look at compared to more aggressive log profiles, but still compared to normalized image it’s easy to see the huge difference. Note that it’s possible to use a different log normalisation LUT than the type of your log footage if it yields more satisfactory results to your eyes, however remember that it will not be a scientifically correct re-map into Rec.709 or sRGB color space. For example, lets assume we have Sony S-Log3 footage. It is possible to use the Cineon log conversion LUT instead of S-Log3 as the two are rather similar in characteristics. Main difference between the two is in the rolloff into highlights. While it’s not a scientifically correct log conversion, if it produces satisfactory results to your eyes, than by all mean do use it. Don’t forget to check your footage or image with a vectorscope, waveform and histogram to make sure the transition doesn’t hurt any essential parts of the image. You can always dial back the log normalisation LUT if you want a lower contrast image. The following image was shot on Arri Alexa. 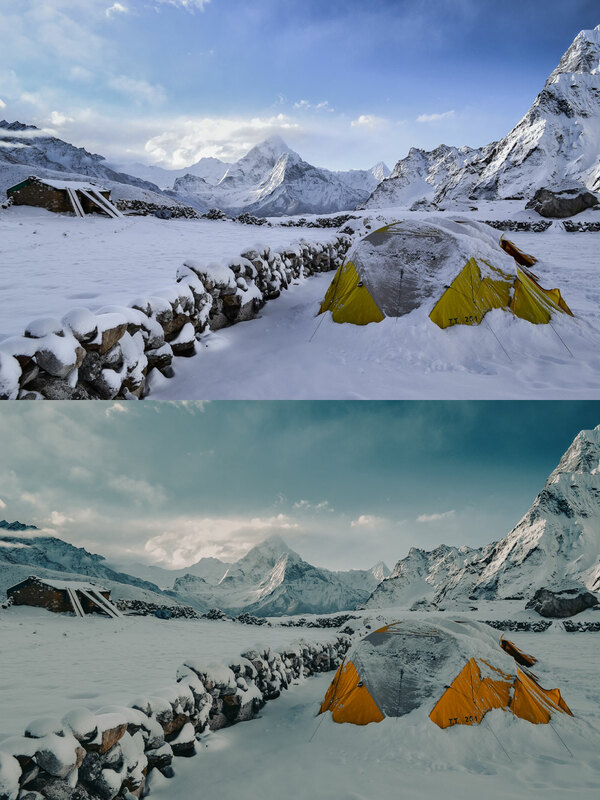 The top image was normalized using the Canon C-Log2 log normalization LUT, while the bottom one was normalized using the correct Arri Log-C log normalization LUT. While using a different log normalization LUT may not be scientifically correct conversion, if it yields satisfactory results, you can do it. Sometimes, if the footage or image is incorrectly exposed, using an incorrect log normalization LUT may actually yield better results. If you’re working with Rec.709 type of footage or stills (except for photos linearlly “developed” in Capture One software), log normalisation doesn’t apply to you. You can safely skip this step, but I still recommend being familiar with the log normalisation terms. Once we have our material normalised it’s time to do some basic color corrections. If you are working with a Rec.709 type of footage or stills photograph from your DSLR for example, your image is already normalised. As I stated earlier, color correction is the process of manually tweaking your image or footage in order to find a correct balance between exposure, color temperature, contrast and light. In perfect world your image would always be balanced. After applying the log normalization LUT you could simply go on and start the creative grading process. However, most of the time that’s not the case. Images often suffer from over or under exposure, the contrast in the scene may be too high or too low and sometimes you simply forget to set the white balance to the correct value. Sometimes you’re trying to match several light sources and some light sources need more balancing. Either way, almost all images will need some sort of basic color correction. As we learned before, first we should normalize our footage. Since this was shot on Arri Alexa, we’ll use the Arri Alexa log normalization LUT from our Lutify.me package. Once we have our image normalized, we can clearly see that it suffers from some under exposure. While this is subjective to a certain extent and we could simply leave the image that way and apply a LUT, I think it would benefit from some minor exposure adjustment. First let’s have a look at our image with a creative LUT applied without any exposure correction. Now, let’s take a look at the same image with the same creative LUT applied albeit with some exposure correction. Makes all the difference. Doesn’t it? 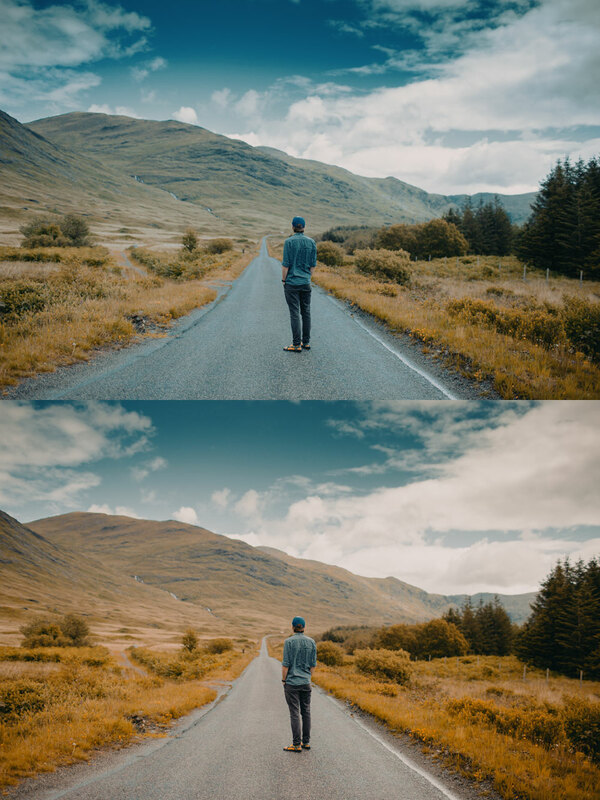 And finally let’s have a look at both of our images with LUTs applied – with and without exposure correction. 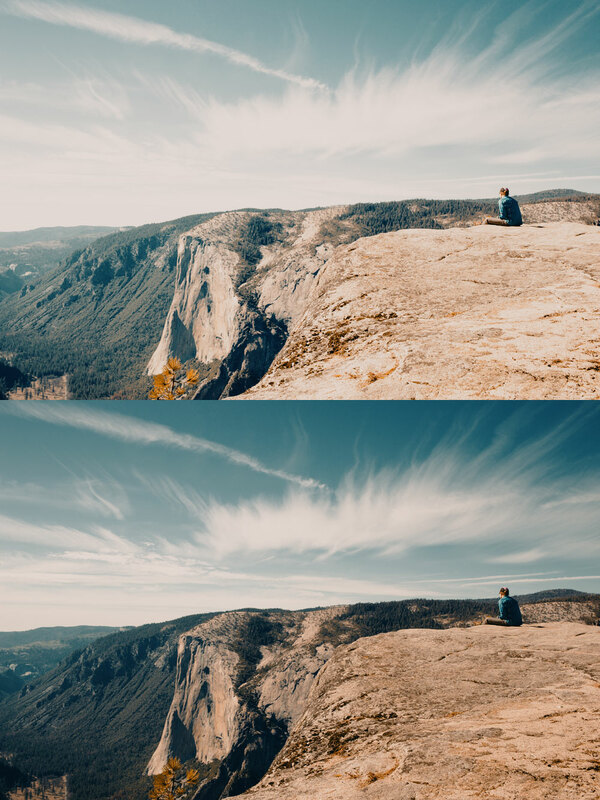 Top image is the normalized log footage with a creative LUT applied and no color correction and bottom image is the normalized log footage with the same creative LUT applied with some basic color correction – in this case exposure adjustment only. Apart from the obvious difference in exposure, the color response is different too. It’s due to the fact that a LUT takes a given input and outputs it to a new level by the same amount for any given input. If our input changes – the output changes too and that is exactly why you should almost always color correct your images prior to applying a LUT. Of course, exposure adjustments can and are subjective. Some may prefer the darker version of the same image while some may prefer the brighter one. 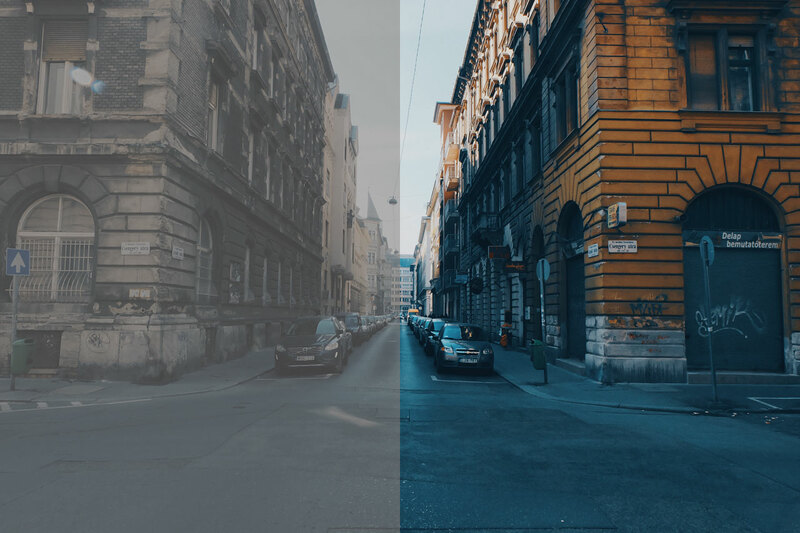 No matter which version you prefer, it’s important to understand that color correction will drastically change your output once you apply a creative LUT so exercise a good judgment before applying a LUT. Remember, even if your image is perfectly balanced, it doesn’t mean it matches the next and previous shots perfectly so at the bare minimum you would have to do some shot to shot matching. Shot to shot matching is an art in itself and one of the most challenging aspects of the color grading process. I can’t cover shot to shot matching in depth in this post, but I must mention it since even perfectly exposed images and shots will needs some amount of shot to shot matching. This means 99% of the time you can’t skip the color correction stage. I said it before and I’ll say it again. LUTs are calibrated for properly exposed and white balanced image so therefore it’s crucial to get the color correction part right before proceeding onto the creative part of color grading. The last step of using LUTs is actually applying the creative LUT. Once we have our image nicely balanced we can go on a apply a creative LUT that would be a starting point for our color grade. Remember, LUTs should be used as a starting point for your final color grading and not as a final look. While sometimes you may be completely satisfied with the result achieved with a LUT as-is, most of the time you will need to make some minor adjustments to better suit your image. No two images are the same so adjustments will be required most of the time. This image was shot on Canon 5DMKIII using Magic Lantern raw. The footage was interpreted in DaVinci Resolve 12.5 as BMD Film. First step is to normalize the footage. For that we’ll use the BMD Film log normalization LUT from our Lutify.me package. The image appears nicely balanced. The way it is, it doesn’t require color correction at this stage. We can go on and apply a creative LUT. After applying our creative LUT we can see that we should do some adjustments to the image. While the overall look is quite nice, the wall on the left is too green to my taste and the skin tone also suffers a from green-ish tint to it. If you’re altering the whole tonal range of the image and giving it an overall color tint (like with this LUT), some color tint is to be expected across all of the image and should stay that way, however it doesn’t mean we can’t and shouldn’t control the amount of the tint and adjust it to our taste. 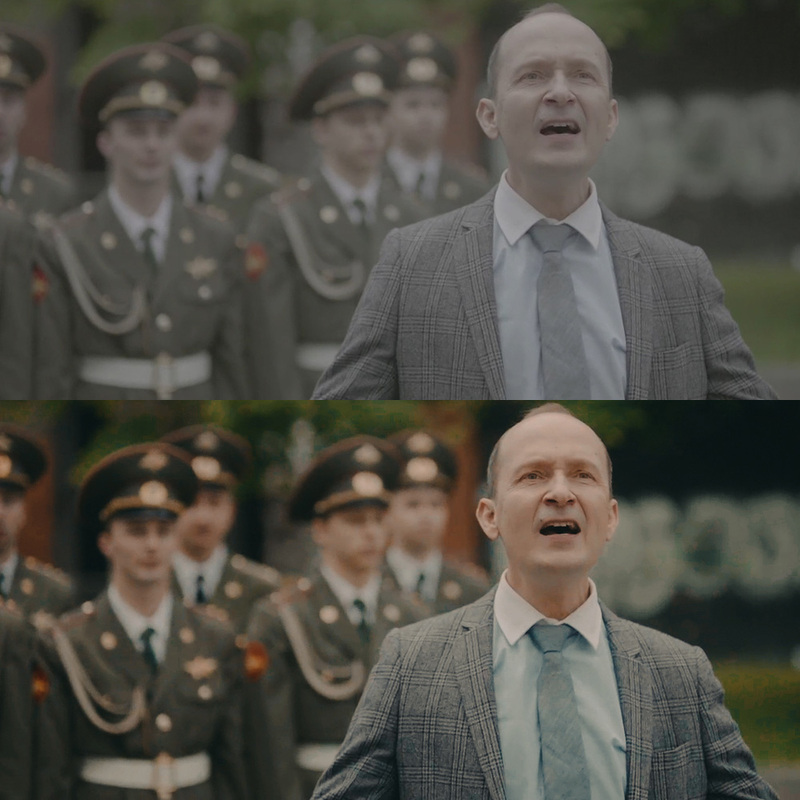 Correcting the green-ish tint improves our image drastically while maintaining the general characteristics of the LUT. The image is much more vibrant, skin tone is lively and the overall tonal range is more pleasing. As a final step we could do some secondary corrections. Secondary corrections is a term for localised corrections meaning corrections that are limited only to a certain area. A typical secondary correction could be brightening the face, darkening the background or isolating a specific color and altering it. Secondary color correction in this case involved a darkening of the wall to the left, slightly reducing the highlights in the skin and a bit of darkening of the hair to the left as well. And finally here’s a before and after image. 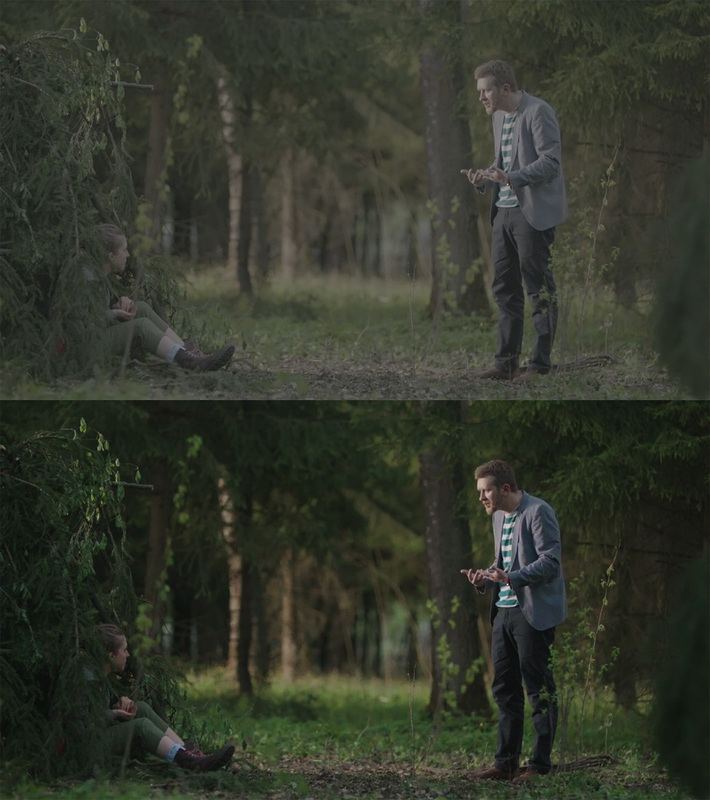 Top is the final color graded image while bottom is ungraded log. Normalize your footage as the very first step. Once your footage is normalised, it’s time to color correct it and balance it. My intention with this tutorial was covering the basics of using LUTs. 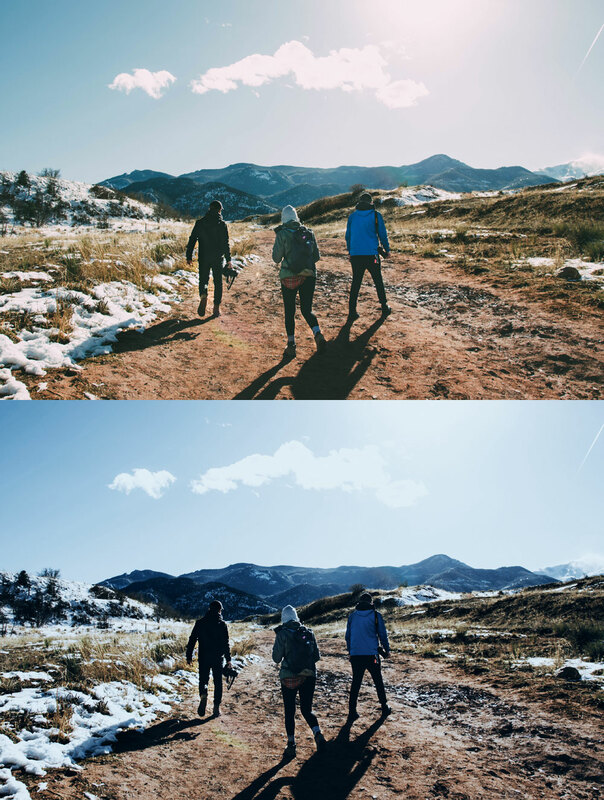 It’s very important to understand that while LUTs can elevate your brand and greatly enhance your color grading, they are not some magical solution to all your color grading needs. Using LUTs requires some basic knowledge and correct workflow to get the best results. What is your workflow for working with LUTs? What steps do you take when applying LUTs? I’d love to hear back from you in the comments below. Tagged Color Correction, Color Grading, Workflow. A thorough and well explained post, thank you! The most well explained use of Luts ever! I’ve searched everywhere and read many about “what Luts are” and “how to properly use them” but all have left me confused and wondering. I’ve managed to get good results thru trial and error and guessing lol but now I know how to get where I want to be the fast, correct and easy way. I finally now know how and when to properly use Luts. Thank you very much, your awesome! Thank you very much! I deeply appreciate it. Thank you very much for this very well explained article about LUTs. I have a question about the secondary corrections. When applying secondary corrections, is it (in Davinci terms) applied on a node on top of the creative LUT node? So you’re correcting the image that’s already been modulated by the LUT? Or do you make these secondary corrections on the node before the one where the creative LUT is applied and see how the LUT reacts on it? Many thanks in advance, and congratulations on this wonderful article! Usually you would do secondary corrections on a serial node/s after the primary corrections, but depending on the needs, you could do secondary corrections on a parallel node. It all depends on which source you require for secondary corrections. Usually this would be already balanced material using primary corrections. For the First Time I got a perfect guide in how to use LUT’s the best way going along with grading footage. I have a lot of LUT’s, from different suppliers and there are different explinations in using LUT’s. With all these information and gathering reactions on fora, I came to my knowledge. Basically I came to the same workflow, due to a lot of trial and error and experimentations, but now have a confident feeling in doing things the right way. Thans for that. I have one comment of the explination of what is a log file, the writer Goran explains. To my knowledge an image sensor translates the amount of light in a linear way and not logarithmic. 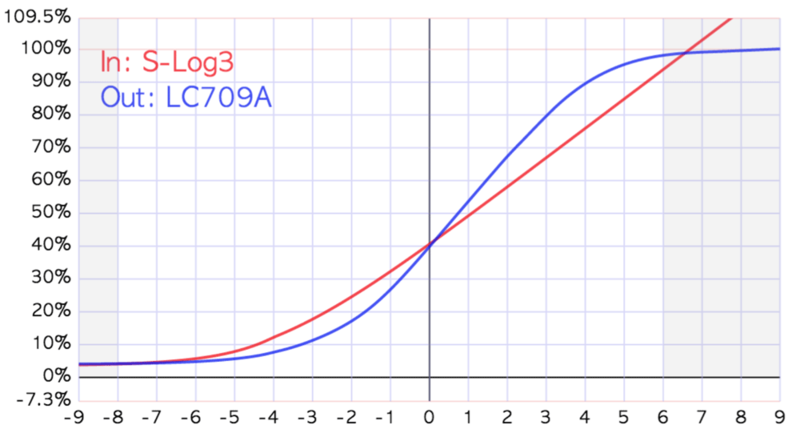 It is the log gamma (curve) which makes it logarithmic in order to preserve all the image information and to get the maximum Dynamic range in Post Production. Or did I not interprete the information correct? That is correct. The sensor is linear. It’s the log curve which makes it logarithmic. Thanks for the awesome breakdown of LUT’s, I haven’t been able to find info on this as clearly as you described it. When on set and a client wants to see a picture, do you use a combination of a normalising LUT and a creative LUT to show them what it will look like? Thanks. Monitoring is slightly different. For most parts, for monitoring you use one LUT that’s tailored for camera’s log curve as most workflows won’t allow loading two LUTs for monitoring. Having said that some camera’s output normalised image to the monitor already (while recording raw or flat) and you only need to apply a simple standard Rec.709 LUT on top of it. It’s also slightly different if you apply monitoring LUT in camera or monitor. Hope this explains it well. Hello Goran and thanks for your tutorial. It help me a lot to understand how use these luts with my 5D mark III RAW footage. I just want know if i can use the normalization Log Lut on the timeline section for node ? I could be more easy and fast in this way, no ? I’m not quite sure I fully understand your question. Davinci Resolve 12.5, in the node section you can see this option : http://image.noelshack.com/fichiers/2016/45/1478606244-node.jpg. You can apply lut just on a clip, or all the timeline. You can apply a LUT to the entire timeline. There are several ways to do it. You could either in color tab select all thumbnails and right click and apply a LUT (it will be applied to all) or you could in color management section of project settings apply a LUT to entire timeline. 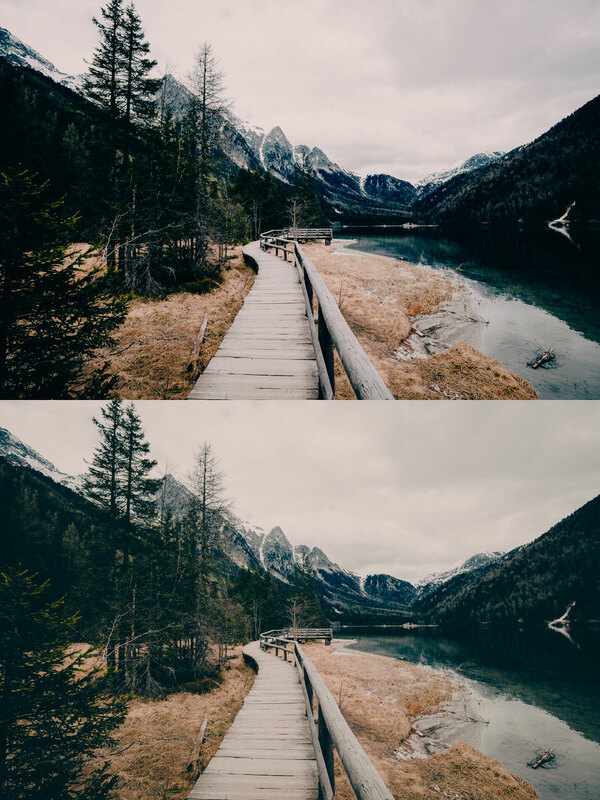 Does lutify.me have any normalization luts for the free lut package? I’ve been normalizing by hand but the luts would save me time! Currently we don’t offer free log normalization LUTs, but we may in future. Where in the process would you denoise if needed? Usually denoising is done early in the color grade process, right after normalization from log. If you’re denoising, it’s common to later on, as last step, you add some film grain. Thank you for this article. I recent;y purchased a Canon C100 Mark II and I’ve noticed that in C-Log there is a green hue. I’ve read in multiple forums about this issue. I’ve talked to Canon and even met with them today in Hollywood. To make a long story short, I was told that Canon cameras do not shoot “true color” like Sony and Panasonic (all I had ever used here in Hollywood) and that it does in fact shoot a bit green and the colors will not be true – Canon thinks it is “creative.” I’m not a fan. I would prefer true color and make adjustments in post if I want a color shift. Do you have any LUTs or know of any LUTs that correct that native green cast? Thank you. I’m not aware of such LUT, but if you’re willing to do some testing, we could create one. Sounds good? Absolutely amazing.. Thank you so much! Thanks Goran, what a great post! Really helps explain the workflow of LUTs. One workflow question I have, specifically for Premiere. I am now using adjustment layers to apply color corrections vs. using lumetri effects directly onto my clips which I have found to be a smoother and more organized workflow. I am wondering if I should separate some/all of these steps into different adjustment layers (similar to separating nodes in Resolve), or does it work to manage it all within one? What is your experience in this? Thanks for the kind words. Keeping it organized in separate adjustment layers makes for a more organized and flexible workflow. I’ve separated my “Basic” and “Creative” LUTs into two separate adjustment layers. Does it make a difference which one is on top in the Premiere timeline? Yes it does. Adjustment layers are applied from bottom to top. Most bottom layer is applied first and so on. Therefore, you would want your log conversion to happen before applying the creative LUT. Therefore, most bottom Log conversion, top creative LUT. I’ve been Vlogging for 4 months and started with my DJI Mavic Pro around two months ago. I’ve been messing so much with color correctiong and grading. This article has been an amazing help an inspiration to me. Some people say they dont see it, but i truly believe they feel it. Thanks for this valuable content! Such a great article. Thank you so much for it. just have one question. After normalising footage, and colour correction, white balance, contrast, etc… should i remove normalise lut, and then apply LOG lut, or leave normalised lut it there in basic corrections, and than apply LOG lut again, or rec 709 lut? After you’ve normalized the footage, you should apply to it a standard Rec709 type LUT. Will I only get the ‘Log Conversions folder’ if I purchase a package, I’ve downloaded the 7 free LUTS, but can’t use the D-Log LUTS as it says – file not recognised, when I try and use them on Adobe PP. (Mac) The R.709 LUTS work fine. Log conversion LUTs are included in the paid packages. As for the error you’re experiencing, please contact us at help@lutify.me, we’ll be happy to assist. I appreciate the detailed explanations. I just wish it was in a video format that just makes it so much more easier to the average joe. Keep up the good work. Thanks Goran! This was very helpful! Which one of your packages have Normalization LUTs? Hey Gaszton, all packages include log normalization LUTs. Great explanation! I am very new to luts editing and as others have said this is by far the best explanation given. I now know that from my Mavic Pro D-Log footage, I need to normalize first, then apply a utility LUT to convert it to REC709 or sRGB, then I can apply a creative LUT. I do have a question though. I am using ColorDirector 5 for the moment, and I don’t have (from my knowledge) adjustment layers per se. It also appears I can only apply 1 LUT at a time? So, do I need to convert my footage from D-Log to REC709, produce it and then use that new clip to apply a creative LUT? I plan on using Premiere Pro in the future. It’s ok if you can not answer this question. 3. Concatenate the log conversion LUT with the creative color grade LUT, which is something we’re happy to do for our paying customers. Thank you so much for this explanation,it is very helpful. I’m a beginner and this explanation is very helpful. Thanks a lot. I’m debating on getting a subscription but don’t want to jump into something that may not benefit me so much or that I cant get the most from using my current toolset. I’m currently using a Panasonic Lumix G7 which has Cine D and Cine V profiles and using Powerdirector 15 to edit and Colour Director 5 to correct/grade. I noticed a question above that someone asked about the normalization process – which I haven’t quite got my head around what it exactly is just yet (I’m just off of a nightshift) but from what I can tell you have to apply and produce the normalization footage and then apply the LUT on top of that in Colourdirector? You got it pretty much right. Most LUTs are designed to work on Rec709 type of footage which you can treat like a different word for normalized footage – footage of normal contrast and saturation. So if you’re shooting log you would first normalize the footage and than apply another LUT on top of it. Having said that, Cine-D and Cine-V aren’t proper log formats so you can work with them using LUTs without any need to convert the footage first. If you would like to send us over a few screen grabs from your footage we would be more than happy to demonstrate some LUTs for you and the way to approach the grade using our LUTs. The only issues I seem to have myself are that because I use Powerdirector and Colourdirector (and not Premiere that allows you to easily tone down the LUT with adjustment layers and opacity) they sometimes come on a little strong and almost ruin the footage. That said I’ve only just started to use Cine V and D because before this I was using natural with the contrast and saturation turned all the way down – but I heard somewhere that doesn’t produce the best results and Cine V and D are the best profiles to use for grading. Not having control over LUT’s opacity can be limiting but if you’re using the appropriate LUT for your footage (Rec709 for normalized footage) you should be pretty ok. Having said that, you can adjust the opacity of the LUT yourself if you have access to Photoshop. Simply load the LUT, adjust the opacity of the ‘Color Lookup’ adjustment layer and export it as a new LUT. Use that one with Powerdirector and Colourdirector. Should you have any specific questions or if you have any doubts about the best way to treat a specific footage, feel free to contact us. As for Cine-V and Cine-D as profiles there’s nothing inherently wrong with them. Usually it’s the 8-bit footage recording capability of the camera that can pose some problems. Just to make sure I get the best results I will shoot in Cine D but in your opinion is it “best” to just apply the LUTS directly to that footage in colour director? Or is it best to colour correct it and get it looking natural first and then apply the LUT? Or should I apply your cine d normalisation LUT export (as I don’t have adjustment layers with CD) and then grade the footage? Regardless of your software or camera, you should always first color correct and balance the footage before applying the LUT. You can use the Cine-D conversion LUT but that will only set the contrast technically right. It will not correct white balance, exposure or other issues, so it’s necessary to correct these before applying a LUT. Having some good fun playing around with the basic version of your LUTS but im severely hindered by Colour Director 5 in that i cant adjust the intensity or strength of a LUT. A way around this would be to get Adobe Premiere or even Photoshop as i could alter the LUT strength and then save it as a new file HOWEVER i dont particularly want to do that as i’m saving for a drone, have already purchased Powerdirector/Colour Director and pay for an epidemic sound subscription each month and as a hobby it starts to add up! Is there a program out there thats able to adjust the intensity of a LUT for free? You can use the free Davinci Resolve to adjust the opacity of LUTs and much much much more. Thank You! That has worked wonders! Resolve does everything I need at present! Is there a free software apart from GIMP for still images or is that about it if you aren’t sure you want to pay for Photoshop? I’m not too familiar with free software alternatives to Photoshop. If you don’t like Gimp you could try Krita but I think it’s Linux only. Affinity Photo is a great and cheap alternative. Macphun also have some nice software at affordable prices. is using normalization LUT in Log photoge equal convert it from Log form to 709 form? Hey Michael, using normalization LUT is converting the footage from log to a viewable form such as Rec709 or P3. Would be great to see a video format of your workflow with regards to colour grading processes. Thank you very much for this most well explained article about LUTs. I use adobe photoshop for color grading of still photos ,the working colour space setting is adobe RGB. My question is should I change the working color space to sRGB before applying the luts? There’s no need to convert into sRGB beforehand. However, if you’re working in Adobe RGB, make sure your monitor can cover that space otherwise you’ll not get a correct representation of what’s actually there in the image. But I’m a little confused. I think when applying a lut on a photo, the result should be photo color space related. I understand that the Lutify.me luts apply to Rec709 photos. Can I apply a Lutify.me lut directly on a photo with AdobeRGB1998 or Prophoto Color Space? LUT is colour space related but in case LUT targets colours out of your current gamut or if some colours are not treated by the LUT’s gamut because it’s too narrow your software will “gracefully” take care of that. You can apply our LUTs on Adobe RGB and Prophoto gamuts. However, to the best of my knowledge, there’s currently no monitor that displays Prophoto RGB so you will not really be able to tell what’s going on in the image. The first question is why does your Cine d to 709 Lut look different from Ground Controls Cine d to 709 lut? Shouldnt they look the same? Lastly how I have been grading my footage/applying luts has been to convert my footage from cine d to 709 with your lut (in davinci resolve) then adjust the contrast, saturation, white balance and exposure to my liking and finally applying a lut. Is this the “correct” sequence? Shouldn’t they look the same? Theoretically yes, practically never. Why? Rec709 defines color primaries and levels. However, it doesn’t define the way to roll-off the highlights for example. Therefore there will be inevitable differences between different log conversion LUTs based on the way different people interpret the formats. Every log footage must be converted into a viewable space in order to be displayed properly either on computer screen, cinema projector or HDR TV set. Theoretically, you don’t have to transform log footage but you can’t really display it that way. You use a log format to have the widest possible dynamic range but once that range is captured you need to make it viewable properly. If you didn’t shoot log you would loose much details in camera which would be lost forever. Log conversion LUT is there to take the wide dynamic range of the log and gracefully “compress” it into Rec709 or P3. Is this the “correct” sequence? Yes. It’s best using global (primary) exposure adjustments on a node before log conversion and perform secondary exposure corrections afterwards. For example, if you’re overexposing your S-Log2 footage, you would first correct it with offset control and than use log conversion. Its weird because I had some footage that had an overexposed sky so in the first node I dragged back as much detail as I could and then applied the lutify cine d to rec709 lut and it made it look worse as the sky was bright again! Do I need to adjust it again in the second node (with log conversion lut) is what you are saying? Could you please send us ungraded screenshot to help [ at ] lutify [ dot ] me? Thank you Goran. It was very helpful and well explained. Thank you so much for posting this. I’m just learning about the power of using luts in my stills work and this post has saved me much trial and error, working out the flow. Now looking forward to some creative post editing. Hello there and thanks a lot for this very informative tutorial ! By the way I appreciate your product that is quite affordable, complete and well documented. Actually, it may sound strange but I am more (only?) interrested by photos and use your LUT package for Capture One and it work well. Still I have a question of worflow related to Capture One. Your worflow is to first normalize (already done for photos ON DSLRs as I understand it) then perform color corrections, then apply the LUT and finally to customize the final result. As I understand it, 3D LUT are implemented as a color profile by Capture One. Doesn’t that means that in practice the LUT is first applied by the RAW processing engine, and then that the various exposure/constrast and color correction are applied… All after the profile has been applied ? In practice is it really the case? And if yes is it a practical problem or are there way to solve it ? Hello Nicolas, that is correct. ICC profiles are applied first and than rest of the corrections. The disadvantage of that approach is that the ICC profile has to handle the camera calibration as well as the look. Naturally that calibration, unless done on a camera basis will lead to slightly different results from one camera to another. You can find more info about it here – https://lutify.me/introducing-luts-for-capture-one/. Would it then be better to output an image to Photoshop and apply the LUT there? Hey Jason, in Photoshop you would loose the raw editing capabilities. There’s always a game of give and take going on in color grading. i was wondering, if my camera (sony a9) doesn’t have the log profile, and i have set a neutral picture profile decrising sharpness, saturation and contrast.Wich is the best way to color correct and color grading the footage? Hey Dere, in that case it would be best to use Rec709 LUTs and manually adjust saturation and contrast. Shoot us an email if you would need further info. Okay i will. Thank you very much! 1. step 3 the creative part, do you still use a LOG Lut or a REC709 LUT? A lot of LUTS come with 2 version. But because you normalize the footage in step 1 I don’t know if I still need a LOG LUT in the creative part or not? 2. Do you apply the log conversion LUT in Premiere in the basic input LUT tab? and then a creative LUT in the creative tab right? But when I do that a lot of times my shadows get goofy when i apply both and i shift the shadows. 1. As footage is already normalized after applying a log conversion you would use a Rec709 LUT. 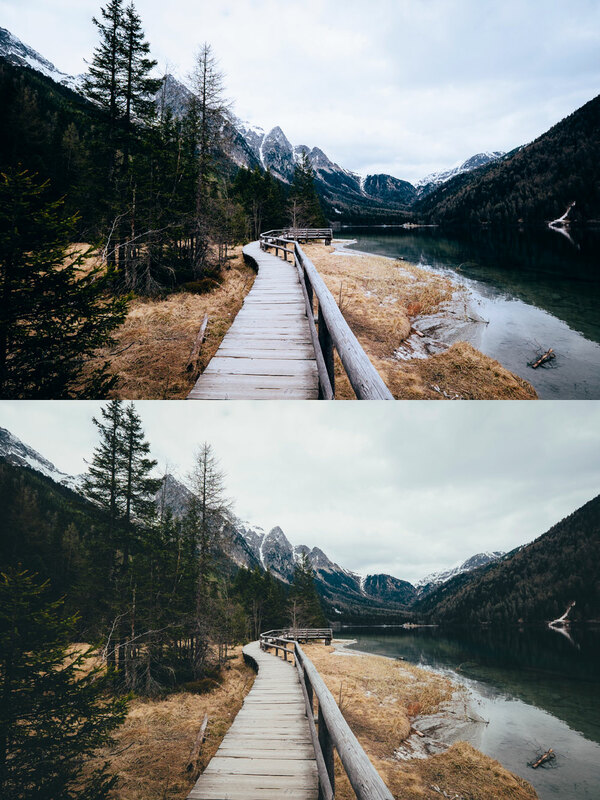 Applying a log LUT would result in additional conversion leading to increased contrast and saturation. 2. You are correct. However, I think it’s best practice to apply LUTs on separate adjustment layers. It offers far better control. You could use a separate layer for log conversion, separate layer for creative LUT, separate layer for corrections, etc. I understand that you have to look at your image in an normalised look like Rec709 for corrections like the color temperature. But if I have an over-/underexposed image I allready have lost some information if I correct the brightness after the normalise-LUT or am I wrong? A) Use the normalise-LUT only for preview-purpose and disable it later again, when the basic corrections are done. Then for the final look I would use a Log-version of your creative or film emulation LUTs. B) Or if I grade in Davinci I would use your normalise-LUT and creative LUT, but do all the basic corrections in the very first node, having the other two nodes allready enabled. C) Or maybe the best solution is somewhere between? : I do the basic correction on the same node like the normalise-LUT? In this case I would manipulate the normalise LUT I know, but if the image looks great, why not? Maybe I’m completely wrong with this alternatives but if I’m right, which one would you choose? I just think I would lose all of the advantages of Log-footage if I do my basic correction in post of the normalize-LUT. Now it makes sense to me. So it would be my Version B). what cameras or drones do you support in your packages? DJI Mavic? Thanks for the amazing advice. Just a quick question… Should I be converting my S-log 2 footage to Rec 709 or DCI P3 to normalize it correctly? What is the different between these two options? Rec709 is HD video standard and is pretty much what most monitors on internet use. Therefore if your output is either TV or Web, you should be using Rec709. P3 is a standard for cinema projection. If your output is intended for cinema projection, you should be using P3. Hi! Thanks so much for the article, I’m rather new to LUTs, but I purchased the pro pack just to jump in the deep end for a project Im working on. A comments and then 2 important questions. 2- My most important question is all of the luts are giving me a almost slow flicker, more of what looks like a fade in and out of the effect that I am unable to get rid of, how can I get rid of this? Log normalisation LUTs are indeed referred to as log conversion. We’ve made this change some time ago. What’s the point of using a Log LUT if we should be converting it to 709 anyway? The point of using log is to allow you to capture a greater dynamic range in camera so you have a better starting point for your grade. A log LUT is a LUT designed to work directly with log footage. As a matter of fact, a log LUT combines in it three functions: a) conversion from wide RGB space into a narrower one such as Rec709 b) conversion from logarithmic gamma into a display referred one such as Rec709 and c) creative look. Log conversion LUTs do 1 and 2. Creative LUTs would be 3. By separating these functions it’s possible to tailor the LUTs to any format out there instead of having a separate set of LUTs for each log format. When would you use a log LUT? When you have one tailored for your log format or when applying two LUTs is not applicable such as certain software. My most important question is all of the luts are giving me a almost slow flicker, more of what looks like a fade in and out of the effect that I am unable to get rid of, how can I get rid of this? LUTs shouldn’t flicker and most certainly shouldn’t fade in or out. That could suggest something is wrong with the software applying the LUTs or with its settings but it’s hard to judge without seeing an example. It may be possible for LUTs to enhance the noise in the shot in some instances but according to your description this is not the case. I see you contacted the support, so we’ll take this from there. The image of the tent is Macrux teal and orange LUT. The cover image is one of the teal and orange LUTs as well but we can remember which. Is it “bad” to apply a LUT to another format besides a LOG? For example if you applied a LUT to a dynamic, flat, or natural format, could that work well, or would you totally recommend using LOG format with LUTs? Thanks! God bless you and peace be with you! Yes of course. For non-log footage you would simply apply a Rec709 type LUT and skip the log conversion part. Thanks for the interesting and clarifying article. Very helpful. Can you please tell me what LUT you used on the first picture under the “What is Color Grading” heading? Can’t be sure as it was quite some time ago, but it’s a teal and orange LUT. Thanks for your reply Goran. Very nice collection of LUTS. I plan on using the Lutify Me LUTS in Capture One Pro. The magnitude of the collection is a little intimidating though. More than 200 LUTS! How do you even begin on choosing the LUT that works best on an image for the feeling you want to communicate? The showcases on the website are very helpful but still… L’embarras du choix, like the French say. That’s a very good question indeed. Usually I’ll start by deciding what I’m after. For example if I’m looking for teal and orange look I’ll start there. If I’m after more “natural” look I’ll probably start with Contemporary Color Film category. Than, over time you start to get a “feel” for the different looks and sooner than later you narrow your search. Quick previews in Capture One are naturally an advantage. Great article and sorry if this question has already been asked but when applying the creative LUT to normalised LOG footage would I then use the REC709 version of the LUT where for instance I have two versions? Yes, after using a log conversion LUT you would than use a Rec709 type of LUT. Thank you for taking the time to put this info together all in one package! I have a question, my Nikon doesn’t allow for log picture profiles, only flat. Would I still be able to apply log LUTs to my videos? Log conversion LUTs should be applied only to log footage. For already normalised footage, such as footage from a Nikon DSLR you would use the Rec709 LUTs. 1. Is it normal to use different Creative LUTs (based on different situation) or just stick to one Creative LUTs when grading a video/film? It’s perfectly fine to use several LUTs. Usually you would want to use different LUTs for scenes that are significantly different, of course, according to the intended atmosphere of the scene. For example you could be using one LUT for all the hotel interiors, while you would use a different LUT for the bar or the beach scene. Great article. Which LUT’s are you using for monitoring (f.e. having a LUT loaded into a Blackmagic Pocket Cinema Camera 4k while filming)? This would be a normalizing LUT, right? Hey Mike, a log conversion (log normalisation) LUT would only convert the log signal into Rec709. If you would want to use creative LUTs, then, these LUTs would have to be in the log conversion + creative look form. Hello Emmanuel, yes you can apply more than one LUT to the footage or image. Some contrast or opacity adjustments may be necessary. For specific help, please contact our support. Hello goran, got your mail, it was well received, and yes I really would love tutorials, or examples of how to do that, if a tutorial video of that is available on YouTube, let me know, if not please guys work on one, it’s really going to be insightful. Thanks for sharing this very “clear” post. Just a question: when and how should i convert my s-log footage to Rec 709 or DCI P3 imagining that I have to project my work both on television and on cinema screens ? Will i have to normalise (and then color correct, cretivly grade and again make the secondary corrections) twice? Hello Simone, in such case, if possible you would want to make the log conversion as your last step. That way going from Rec709 to P3 would require only a change of the log conversion at the end and no regrade should be done. Ideally. However, that is not always possible. Regarding Raw, it doesn’t really matter as the raw footage once captured it needs to be treated in some sort of way and that way would dictate the treatment of the footage. for example, RED’s raw footage can be treated as REDLogFilm or RWG. And how should i work with Pro res coming from a Sony pxwfs5 recorded on a atomos recorder? Thanks a gain for your help! ops! i fogot to mention… what about if i’m recording RAW? Hey John, we slightly edited your message because it may not be the best thing to publish your email address publicly. To download free LUTs please go to https://lutify.me/free-luts/ and register for the newsletter at the bottom of that page. Free LUTs will be emailed to you after registration.